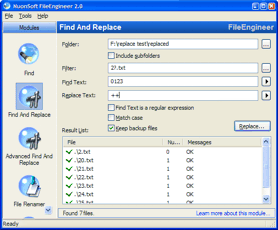 Latest version is FileEngineer 2.0.1. FileEngineer 2.0.1 contains some serious bug-fixes. Users of FileEngineer 2.0 should upgrade to 2.0.1. FileEngineer is an all-in-one program to easily manipulate and work with files. Learn more about the possibilities of FileEngineer. Find: Quickly find a certain string in files or look for specific files. Find and Replace: Quickly find a certain string in files and replace it with another string. Advanced Find and Replace: This is more advanced and allows you to write scripts that you can execute on files. File Renamer: Easily rename a bunch of files and give them a uniform name with or without numbering. File Toucher: In case certain files' attributes or dates get screwed up, you can use this module to touch the files and reset the attributes and/or dates. File List Printer: Allows you to create a list of all files in a folder (and its subfolders if you want) and have this list printed, saved to a file (txt or html) or copied to the clipboard. Folder Size Lister: Gives you an overview of how big each folder on your hard-disk is. This is usefull when you want to know exactly which folders are eating up your hard-disk space. File Comparer: Allows you to compare two files or folders to see if they are the same. You can also check the data on a CD-R with the data you still have on your harddrive to check whether or not the CD-R was burned correctly. File Line Counter: Allows you to count the number of lines in your files. FileEngineer finds strings in files without knowing the file format! This means that you can't use this program to replace a certain string in files with a very specific format (for example Microsoft Word Documents (.DOC)). It does not work with a filter-based system like the search in Windows XP.